Before deploying Office 2016 to client systems, most organizations will want to customize their installation to align with their unique business needs and use cases. In this article, I’ll cover how to customize the Windows Installer–based version of Office 2016 and fully remove Office 2013. I’ll also describe some of the settings you may want to consider for your install. If you’re deploying Microsoft Office 2016 to client systems, you’ll first need to build an MSP file using the Office Customization Toolkit (OCT) for OS deployment and use automated software deployment solutions such as System Center Configuration Manager. 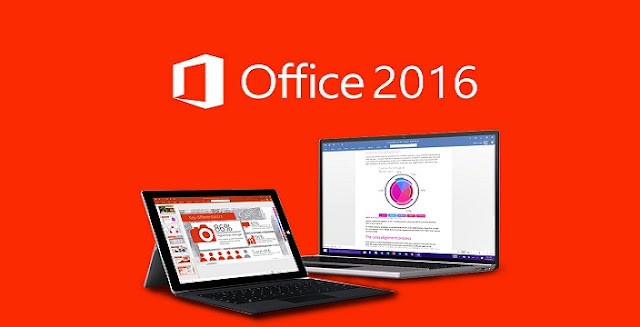 To begin, you’ll need a copy of the Microsoft Office 2016 ISO image (Windows Installer version, not the App-V version), as well as the Office Customization Toolkit (which also includes the Office 2016 Administrative Templates). Extract both the ISO and the contents of the ADMX/OCT download. For my lab environment, I have a software file share on a file server, and I’ve created separate x86 and x64 folders inside my Office_2016 folder to store both installers. The network share and file permissions are configured so that Domain Computers have Read access and IT users have Full Control, but your permissions may vary based on your environment and software installation solution. 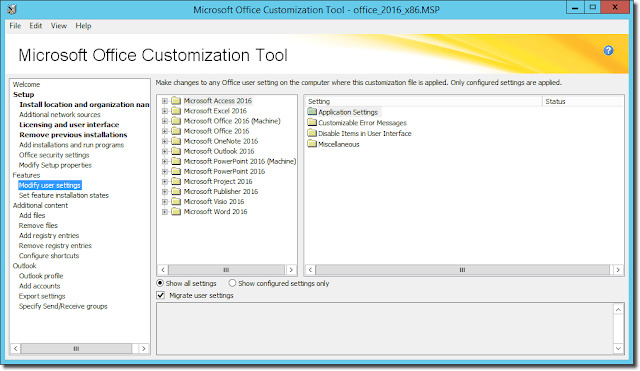 Copy the “admin” folder from the Office Customization Tool download into the folder where you’ve saved the Office 2016 install files. (In this tutorial, we’ll be using the x86 installer in a folder of that same name, but the process is the same for the x64 installer.) 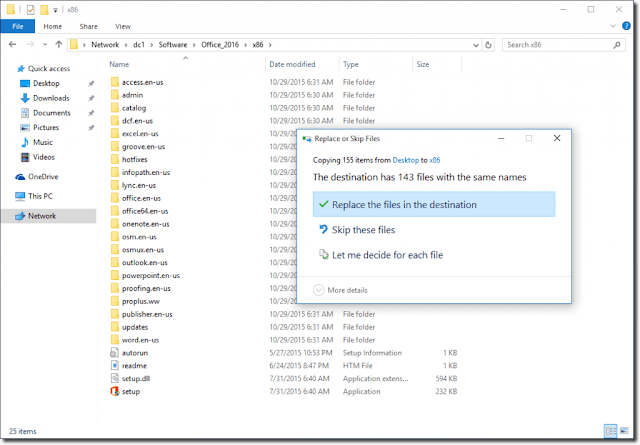 When you’re prompted, overwrite the files that are in the destination folder. 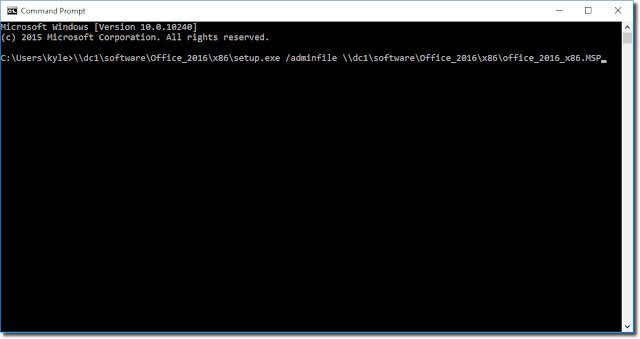 Next, you’ll need to open a command prompt and run setup.exe /admin to run the Office Customization Tool. 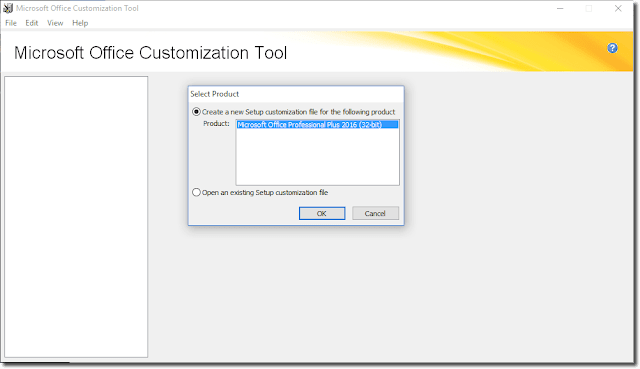 When the OCT opens, leave the default Create a new Setup customization file for the following product option selected and click OK. There are three main areas that you’ll definitely want to customize for your organization’s Office 2016 installation, at a minimum, inside the Setup section. Start by setting your organization name in the Install Location and Organization Name section. Next, go to the Licensing and User Interface section. 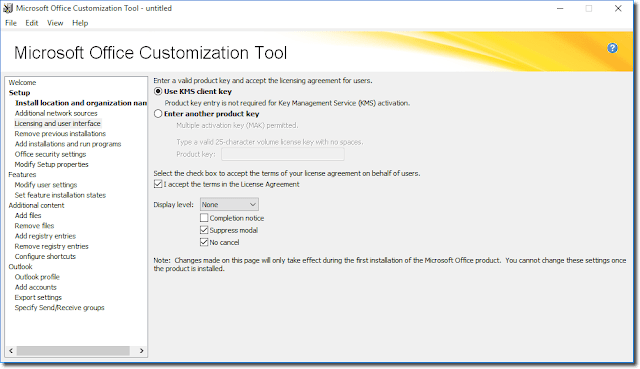 Most organizations with a licensing agreement will probably leave the default Use KMS client key option, but you can set a MAK key here if necessary. Select the I accept the terms in the License Agreement check box so that end users won’t see the license agreement when Office is installed. Last, set the display level to None and select the Suppress modal and No cancel check boxes. Leave the Completion notice check box cleared. These options will give you a silent installation without a final confirmation. Next, go to the Remove Previous Installations section. Here you can choose which previous versions of Office applications are uninstalled when Office 2016 is installed. I’ve had some unexpected results in the past when using the Default Setup behavior. So, I usually configure all of the applications to be removed unless I need to leave certain applications installed on the client system. Once you’re done with your customization, click File and then Save and save your MSP file to the same network share where you’ve saved the Office 2016 installer. I usually like to put it in the root of the same folder as the installer. Depending on which components of Office 2013 were previously installed on a client system, you may still need to run an uninstall to remove Office 2013 completely. To do this, you’ll need the setup.exe and install files for Office 2013. In addition to the settings I’ve already covered, you can also pre-configure a number of user settings when Office is installed on a computer. These settings are included in the Group Policy ADMX files, but they can be useful if you don’t want to manage Office with Group Policy or if you need a pre-configured build for non-managed systems. There are quite a few settings in Features > Modify User Settings, but following are a few you might want to consider for your installation.